Chocolate pearls are having a high-calorie moment. They've been on the radar for at least a decade, but I'm seeing more of them at all price points– and a lot of misinformation. So, time for another pearl tutorial, possums! 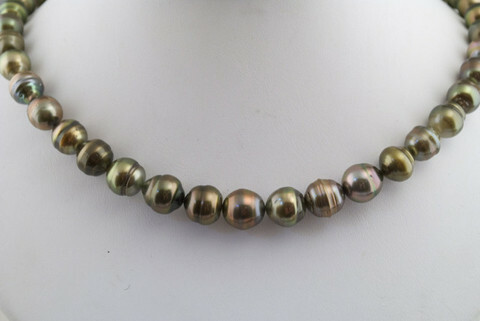 Ninety-nine percent of Tahitian pearls are treated to get the 'chocolate' colour; the usual method is to chemically lighten a black pearl. (The treatment should always be disclosed by the vendor, who uses the term "treated" or "enhanced" or a phrase like "treated by a proprietary process".) 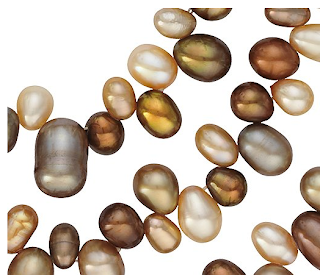 Freshwater (FW) pearls are dyed in shades that range from deep brown to coppery-gold, and the term "dyed" should be disclosed. But once in awhile there is a rare exception: natural coloured chocolates. 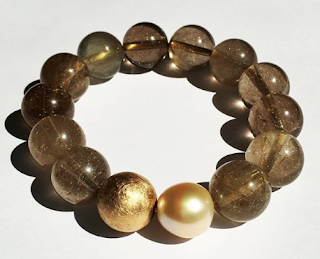 The Tahitian pearls shown above (now sold) from Kojima Company are those natural colours: the oysters made this sumptuous assortment. Besides the lush chocolate, I saw glints of pistachio, khaki and aubergine. 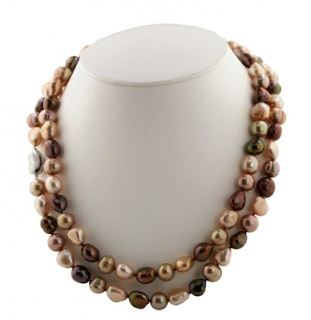 Very different from treated or dyed pearls, full of organic life. These banded (or ringed) off-round and semi-baroque shapes will read as less formal and 'lady' than perfect spheres. The price was $720; if you contact Kojima Company, the most helpful Sarah Canizzaro might be able to find more, if you are patient. 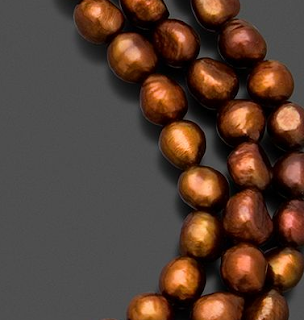 Here's the detail on a 64-inch strand of 7mm dyed freshwater potato-shaped chocolate pearls on sale at Macy's for about $115 (and I wouldn't pay more). No worries about wearing on vacation–pearls like this, cheap and cheerful, are still superior to fakes with their too-sharp, dead surface. HinsonGayle offer a strand of 10-12mm chocolate FW baroques complete with breathless copy that says "Beautifully-toned chocolate brown baroque pearls of this quality are extremely hard to come by." They do not say they are dyed, but they are. Clasp is silver, free shipping; price, $799. There seems to be a chocolate premium here; compare against this strand of grey 12-13mm baroques from Ross-Simons for $175. You would want to see the necklaces; both provide full-refund 30-day return policies. I also like this 72-inch rope of mixed chocolate, peach, mocha and white freshwater pearls. Dyed, yes, but the mix is subtle and sprightly. Size of pearl not specified, but they will, I'm guessing, be smallish (3-6mm) and that's fine for this very long scatter-strung rope, which you can wear so many ways. From Blue Nile; price, $85. I say, Don't choose a colour that doesn't exist in nature; like dyeing a poodle mint green, it's just wrong. But this mixed 36-inch chocolate rope of ringed 9-10-mm FWs for $240 has a lively mix of tones. Lustre looks good, but again, with a 30-day limit on full refund (minus $8 handling fee), you can examine them without obligation. What if the mocha-to-malt palette doesn't suit you? This was supposed to be an all-chocolate post but I keep going back to gaze at these, thinking especially of certain readers. 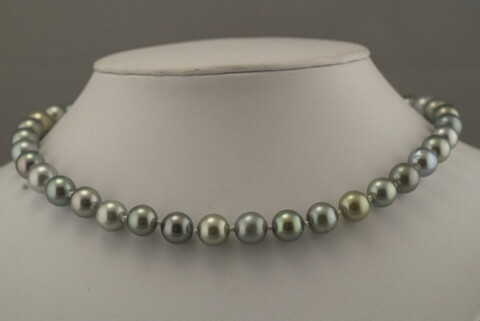 (Three letters, begins with L.) Seventeen-inch Silver Pearl Princess necklace of 9-10mm platinum, pistachio, blue and dove greys. Oh baby, these are gorgeous. A little more classic, but very "Wait a minute, let me see your pearls." Also from Kojima Company; price, $1,957. At first I thought they had invented a new kind of candy! Pearl chocolates -- doesn't that sound delicious! I love pearls but, oddly, don't own any, except earrings, and of those I have many. I'm a little intimidated about the different kinds, value, and what kind of necklace would look good on me. I think I just need to read more. And, of course, spend time trying some on! And by "read more," I mean read more of your excellent pearl posts. 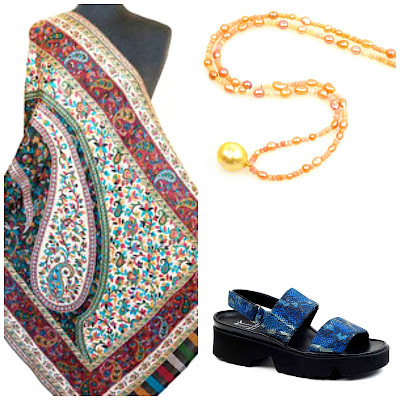 chicatanyage: No coincidence that those are the natural colour pearls- and my preference too. sisty: If you wish, feel free to send me your photo, budget and any other criteria, and I'll round up some ideas, just for your musings. Pearls are my passion and I do not represent or profit from any vendor. into pearls that have never been seen before. Hilarious and my grammar is quite shoddy! Indeed, I should have added quotation marks! A strictly vanilla and platinum girl, I thank you for including that last necklace! I've stared at it before, and at a certain single silver natural Tahitian (the near-round one with the slightly hammered effect) I'd love to have set into a ring some day. --And as you've opened the door to the silver shades, may I take advantage of your pearl passion to ask you about a curious little vintage necklace I found in my thrift-shop foraging? It was a homely thing: 3 graduated strands of weirdly shaped silvery blueish gray pearls ranging from tiny to 6-7mm, forming a tight Mamie Eisenhower-style choker with an aged "amethyst" and seed-pearl clasp. Somewhat round or tear-shaped, most of the pearls have bumps, knobs and blotches; some have blackened open ends--a bit like decayed baby teeth, I couldn't help thinking--but others are lovely and lustrous, almost iridescent, with hints of peacock and violet. For $7.00, I couldn't resist bringing the necklace home to study it. I cut the pearls from their rotting strings and wondered: What sort of bivalve made these little pearls, and who thought of making such small, imperfect specimens into a necklace? Who, back in the 1950s, would have bought it? Any ideas, Duchesse? Can you solve my pearl mystery? I do love those grey pearls. To me part of the beauty of pearls is the light they reflect up onto the face. For that reason, I just haven't warmed up to the darker versions. C.: I'd need a photo, as closeup as possible which you can send c/o my e-mail. Any oyster can make little, non-round pearls with blemishes. I can show photos to some pearl friends who might weigh in (this is our idea of fun). Look at the pearls closely near the drill holes- use a loupe. Can you see any nucleus (the bead used as an implant in culturing)? You might pick the better ones and use as is or mix with others. I have some like that, worked with wire, dangling off a chain. C: My PS got cut off. I am guessing they are Japanese given that they sound like 40s or 50s era, b/f the Chinese farming really took off. Thanks for the insights--I'll see what my camera can do tomorrow. I, too, wondered whether my pearls might be natural, but alas, most of them show the bead nucleus quite clearly. In fact, it looks as though the nacre did not want to adhere to the bead; there appear to be slight gaps between the nacre layer and the nucleus in several of the pearls , and always the nacre seems to pull away from the round, making a tear or comet shape. Could they be the product of an experiment with some nucleus material the oysters didn't like? I'm also wondering whether the blue cast is the result of dipping in a dark blue dye which could have stained the exposed inner layers and given them that blackened look. Japanese is a very good bet, I think, but it's strange: the only mid-century Biwa pearls I've seen before were very different--small, round, and luminously white. The father of our Japanese exchange student gave a necklace and brooch to my mother in 1965. The more I study pearls, the more I love them. The truly natural colors call me the loudest, as do the lumpy bumpy baroques. Have you seen the color some call "pond slime"? Sort of a coppery green layer over other freshwater colors. Weird and wonderful. c.: There were, and are, many grades and variations of Biwas. Biwas are cultured saltwater pearls as opposed to the Chinese pearls that have overtaken the market, which are freshwater. Production of Biwas is way down due to pollutants and viruses. Anyway, I like what you are doing with your strange old pearls! LPC: That last strand of Tahitians was selected with you in mind. Louise: I love pondslimes and own some. Look for even coverage on the pearl, not patches. Kojima Company usually offer some and can guide you to buying one or a strand. 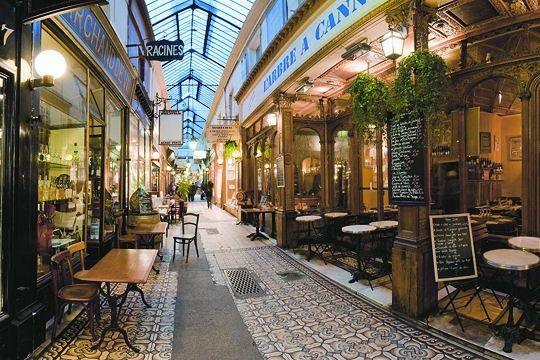 Duchesse -- I emailed you -- thanks a lot! Hi nice to meet you, came though Tabitha. I won't allow myself to buy good pearls as I lose all good jewelery but I love to look. I saw a beautiful necklace in Sayulita Mexico with a black pearl, just a single pearl on a leather strand. a gorgeous lone choccy! sisty: Maybe just "pond pearls"? About Last Weekend: Hi! That's such a great style for warm weather or casual. Even if lost, not a big deal. Very interesting post; I love pearls but never knew about the chocolate ones.